U.S. Aéropostale offers you an amazing possibility to save money right now! Visit any U.S. Aéropostale store and enjoy shopping. Take $10 off your $40 or more purchase. Or, take $20 off your purchase of $75 or more. You can receive the offer when you show a special coupon to cashier. 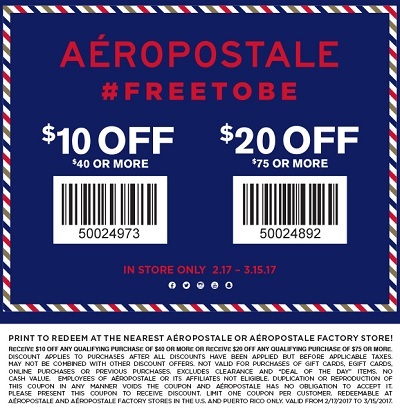 Download U.S. Aéropostale printable coupon now. Source of the information is Aéropostale. Offer is valid until March 15, 2017. For more details visit any U.S. Aéropostale store or U.S. Aéropostale online.